I believe this will be particularly resonant with leaders in the sustainability movement and others that are challenging the traditional way of doing business and seek to transform our relationship with each other and the biosphere as a whole. Roberts walks us through deceased psychologist Clare Graves’ theory of the eight basic thinking systems that have evolved over the millenia and how these systems impact our ability to understand each other and ultimately inspire each other. Roberts encourages us to expand our thinking in order to be able to empathize with the recipient of communications so that there can be compassion for and understanding of others who often view the world very differently than we do. Seeing these thinking systems described in detail was very liberating for me, because many questions I had about how people can be exposed to the same stimuli but see, hear, and feel such vastly different things were answered. Beyond just outlining the 8 primary thinking systems, he goes into specific detail on how to get beyond the filters we all have in place for inbound information – a Sensory filter, a Mental filter, and a Spiritual filter, so that inspiring messages can be tailored for the intended audience in a way that resonates with them. 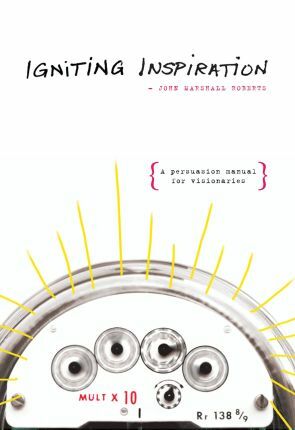 There are even worksheets in the back of the book so that you can take your own situation and use these insights to create inspiring messages of your own. This is definitely not casual reading, but instead it is designed for people that have a burning desire to bring about meaningful changes in a world that seems increasingly out of control. It’s for the ‘Be the Change’ set, if you will. Progressive-leaning CEOs, Creative Directors, Directors of Sustainability, Executive Directors for Non-profits, and Social Entrepreneurs are all prime candidates for this message. I highly recommend this book, and encourage everyone to take a moment to consider if they are a good fit for this type of reading. And even if you are not, perhaps you know someone that this might be perfect for. If so, I’m sure they would thank you for passing it on. Not sure if this is right for you? You can always head on over to John’s blog where he posts interesting nuggets from the book in the form of blog posts and short videos. If you do end up reading it, I would love to hear your take. Previous postA Change of Scenery Next postInspire.